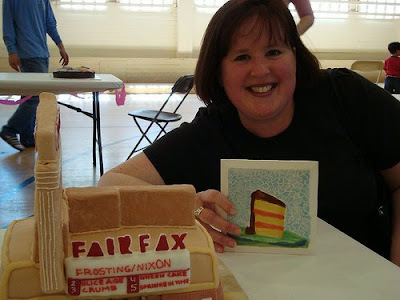 The event was a hoot - about 12-15 cakes made by kids and adults with lots of different takes on the theme of "Fairfax." 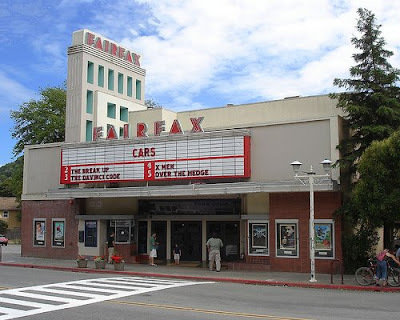 I'm not an expert in fondant by any means - and I definitely learned a thing or three in the process of making the all-carb replica of the iconic Fairfax Theater. 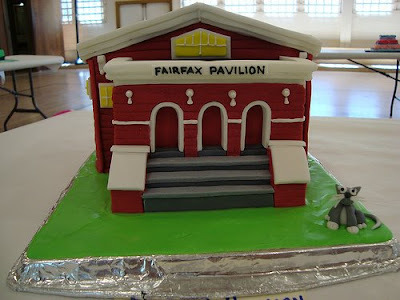 The Fairfax Theater - in cake! I started with 2 10" x 15" layers of basic yellow cake (flavored with almond extract just for kicks). I cut them in half and stacked three of the layers to form the main part of the cake (I've got plans for that fourth piece - watch this space!) I filled and frosted them with the Crisco-based class Buttercream we use in the Wilton Classes, and say what you want about Crisco but I'm glad I did because it was 80 degrees today and I hate to think how the cake would have behaved had it been made with my usual NeoClassic Buttercream. Per the recommendation of R.L.B. 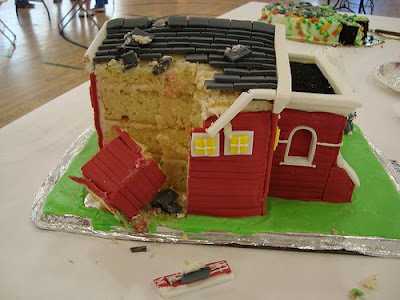 in the Cake Bible, I beveled the top corners of the cake before covering it in fondant, in retrospect, I think I would have left the sharp edges and cut slabs of fondant for each of the sides, but hey - you live, you learn. R.L.B definitely got it right when she said to color the fondant in the food processor - it worked brilliantly! The architectural details were made out of Rice Krispies treats - and I must give full props to Max Starr for that brilliant suggestion. I snipped and bent a small arrow-shaped cookie cutter into the rectangle needed for the top piece. 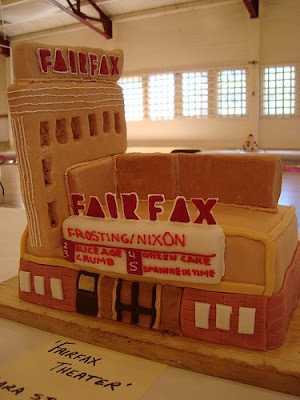 The "Fairfax" sign was made using the Wilton Color-Flow product, but the technique works with royal icing as well. I made a template for the letters on a piece of paper, then put a sheet of waxed paper over it. Then I outlined the letters in white full-strength icing with a #1 tip and let them dry for a few minutes. Then I thinned out and colored the frosting red and let it flow from a #2 tip into the outline. It took a few hours to dry, but once they did the letters were rock hard and will last forever. After the prizes were awarded the cakes were cut and served - I was glad to see that Amy Gosman had entered the contest because she's a fabulous baker and I knew her cake would be both pretty and delish - and it was! Her fondant tie-died T-shirt covered a yummy chocolate cake filled with cherries and hazelnut meringue cream. 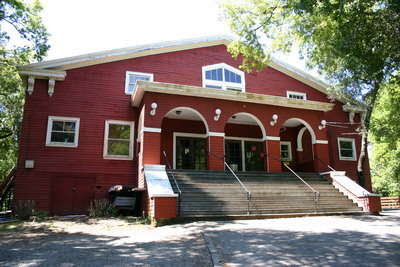 The Pavilion After the Quake - Get Ready Marin! My first foray into competitive cakery was a a lot of fun, next stop: Marin County Fair! Sprinkle gelatin over the water in a 2-cup heatproof glass measure and let stand for 5 minutes. Set into a small pan of simmering water and stir until the gelatin is dissolved. (This can be done in a microwave on high for a few seconds). Place the sugar in a bowl and make a well in the center. Add the gelatin mixture and stir with a lightly greased wooden spoon until blended. Mix lightly with greased hand and knead vigorously in the bowl until most of the sugar is incorporated. Turn onto a smooth, lightly greased surface such as Formica or marble and knead until smooth and satiny. If the Fondant seems dry, add several drops of water and knead well. If it seems too sticky, knead in more powdered sugar. The Fondant will resemble a smooth, well-shaped stone. When dropped, it should spread very slightly but retain its shape. It should be malleable like clay, soft but not sticky. Rolled Fondant may be used at once but seems to work more easily when allowed to rest for several hours, preferably overnight. It is important to keep Fondant covered to prevent it from drying. Wrap tightly in plastic wrap and place in an airtight container. It will firm slightly upon standing. When ready to roll out, spray the work surface and rolling pin with nonstick vegetable spray. Oh Very COOL! Well done! So adorable -- wish I could have voted in person! You should have won just for thinking up "Frosting/Nixon!" Teaching people how to make pink frosting roses makes me even happier. My New Book is Available Now! Available wherever books are sold - September 2009! Check out my first Cookbook! It's a party in a book! Saturday Class: Send In The Clowns! 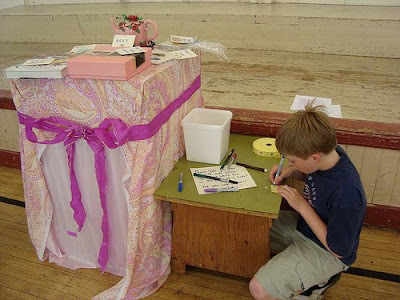 Saturday's Class: Over the Rainbow! More fun in Cake Class!